For years, Goa has been known as the hippest and most happening place to be in. Bejewelled by pristine beaches, breathtaking waterfalls, carnival fest and great seafood, there is also another part of Goa that gives a glimpse into its history and heritage. 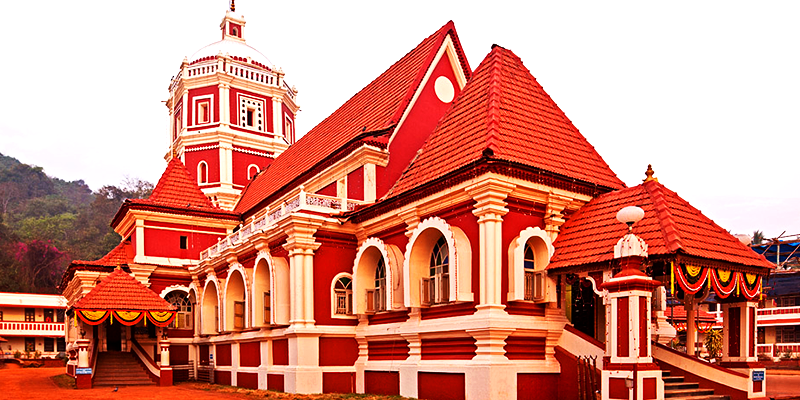 Goa was ruled by the Portuguese for 450 years and during that time the colonials built many magnificent churches. But, even then, there was a small section of Hindus living, and they built some exquisite temples. Though these temples are lesser known, then their glamorous Church counterparts, but they are definitely worth a visit. 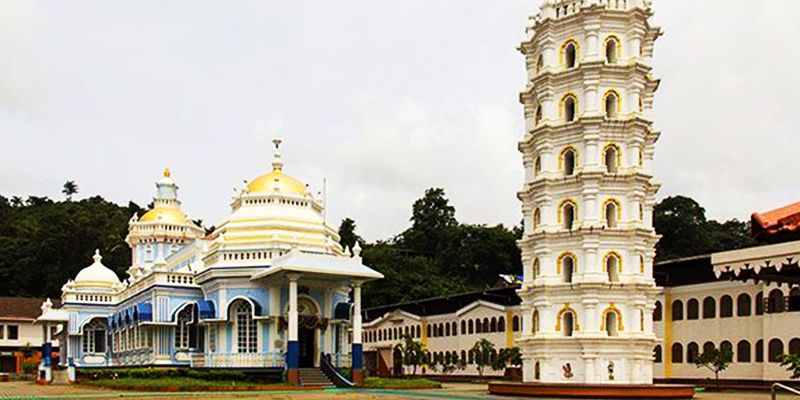 Let us explore some of the beautiful temples of Goa today. One of the largest temples in Goa, this 450-year-old temple is dedicated to Lord Manguesh, an incarnation of Shiva, and draws over a hundred people every day. It’s simple yet elegant architecture consists of several domes and a golden kalasha (holy vessel) atop the tallest dome, pilasters and balustrades and chandeliers of the 19th century. There is a prominent Nandi Bull, a beautiful seven-storey deep stambha or lamp tower (which comes alive in the evenings when hundreds of butter lamps light it up) and a magnificent water tank (believed to be the oldest part of the temple). Trivia: Every Monday, a procession is held where the idol of Lord Manguesh is carried in a Palakhi and accompanied by music. This is held before the evening Aarti. Annual Event: Annual festival of the Temple falls on “Magh Pournima” (month of February). During this event the idol is taken around the streets in a special chariot that is pulled by the devotees. 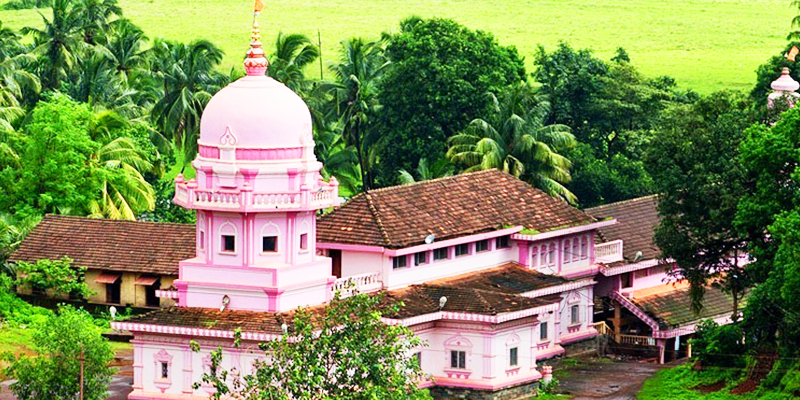 Shri Shantadurga Temple was first built as a small mud shrine and later converted into a temple. As the name suggests, it is dedicated to the goddess who mediates between Vishnu and Shiva and the idol is shown as holding two serpents, one in each hand, representing Vishnu and Shiva. 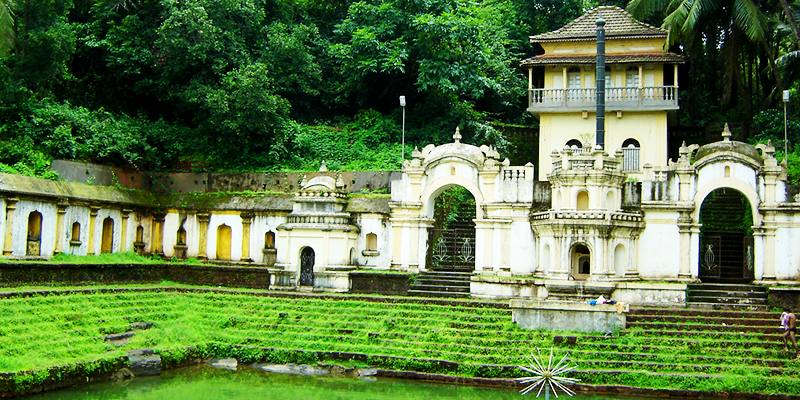 Situated on a slope of a mountain chain foothill, this temple boasts of a fusion of Indo-Portuguese architecture. It has pyramidical shaped ‘shikaras’ on the roof and Roman-arched windows in the main hall with stained-glass window panes in deep red, yellow, blue and green colour. The pillars and floors are made of Kashmiri stone. The highlight of the temple is its golden palanquin (palkhi) in which the deity is carried on festive occasions. Must See: Abhishek or ritualistic pouring of curd, milk and honey on the deity Goddess Shantadurga and the Shivalinga. Annual Event: The Palakhi Utsav is held every Panchami, where the goddess is seated on a golden palanquin and taken out in a procession. It is a 12th century Shaivite temple and is notable as the oldest temple in Goa. 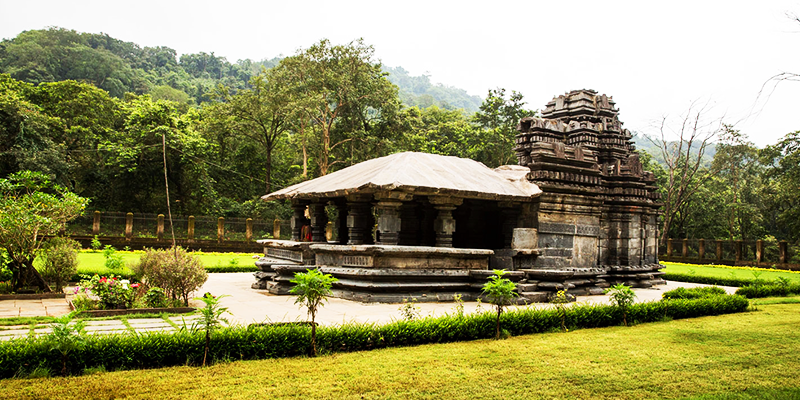 According to folklore, this temple has an unfinished look because it was built in a single night by the Pandavas. It is also considered to be the only specimen of Kadamba-Yadava architecture remaining in Goa. Located deep in the forests at the foot of the Western Ghats, it is dedicated to Lord Shiva and the local legend has it that a huge king cobra is the permanent resident in the dimly lit interior. The temple faces east so that the first rays of the rising sun shine on the deity. Annual Event: Mahashivratri (around February or March) is celebrated with pomp and gaiety when hundreds of devotees assemble at the temple. This eighteenth century structure is dedicated to Narashima (or Lord Vishnu’s fourth incarnation in the man-lion form) and his consort Goddess Lakshmi. It is learned that the ancient temple was shifted from its old location, with other deities of Sri Vijayadurga and Sri Shantadurga, to its present location in the year 1567. One of the interesting features of the temple is the presence of a fresh water spring that fills the temple tank. There are lots of coconut trees on the side and a nice ceremonial gateway at the entrance. The hall leading to the shrine has images of the different avatars of Vishnu. Must See: Fresh water spring, intricate carvings and reliefs on the walls. So, the next time you visit Goa, follow this offbeat itinerary and you are sure to feel the peace and ethereal charm of these majestic temples that relax and energize you simultaneously.